Standing in the middle of a geothermal wasteland, covering my mouth with a bandana to ease nausea from the smell of rotten eggs, I realized that the beauty of Iceland was not limited to the natural phenomena, generously spread around the country. The real beauty was unseen. Iceland is probably the only place where you can feel that Earth is alive indeed, that it breathes, constantly moves and changes. And at that very moment, I realized that we were breathing in unison at the same pace. There was 4 of us on this journey, so you would have to pro-rate the expenses according to your group. Our total budget for the trip turned out to be $846 per person. This is without food and plane tickets. We rented a car at rentalcar.com, as it was the cheapest option. We were looking for 4x4 with automatic transmission and the prices in other places were much higher. BTW, we are not paid for them to promote the site. Note, there were few difficulties with the rental car company — we had to take shuttle to their base, which was 10 mins from airport, they put $2,000 hold on credit card until the car was returned, and a price to rent GPS was ridiculous. 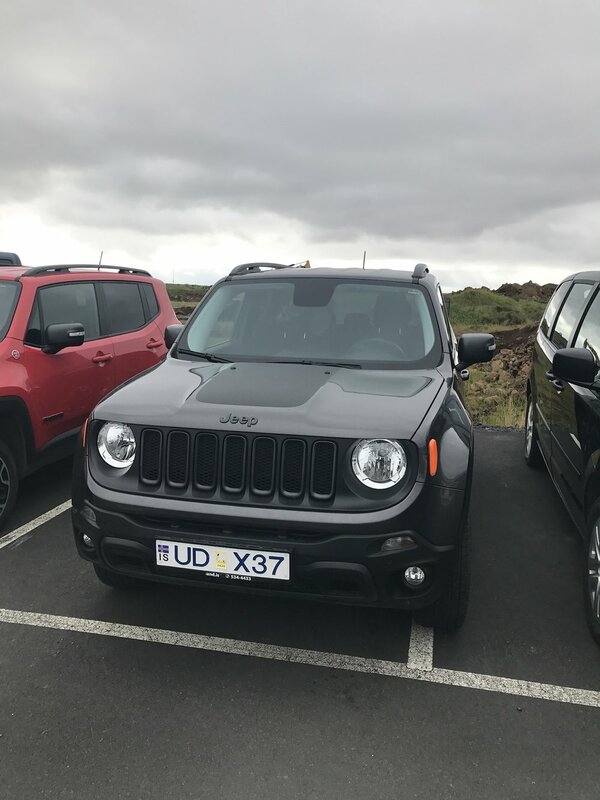 We paid $761 dollars to rent our Jeep for 9 days, $114 for GPS, and $110 for the insurance ($246 per person). We drove A LOT (best estimate is 3,500 km) and covered, Westfjord as well. It is hard for us to estimate the total mileage. We spent $580 on gas ($145 per person). We were staying at Airbnb and hostels most of the time. We spent $1,820 on accommodation ($455 per person). Food is hella expensive. Hot dogs became our best friends. As well as Bonus — one of the cheapest supermarkets in the country, where we stocked for food. Here's our map on Google Maps, that we used for planning. We didn't cover it all but some might find it useful if you want to extend the trip. We arrived to Keflavik on our purple WOW, having already introduced ourselves to Icelandic culture through consuming Bjork liquor onboard. Btw, it tastes great both on its own and with tonic. And the birch’s branch, carefully put into a bottle by Iceland virgins in springtime, makes a perfect stirring device. Since we had such a productive introduction, the inability to figure out how to get car rental and why our company’s name is nowhere wasn’t that frustrating. All we had to do was to actually read a rental agreement where, in bold, it was stated “Call on arrival for shuttle pick-up”. Hint: the most important part of planning was to get enough alcohol to last for 10 days. Spoiler alert - we ran dry in the middle of a trip and had to consume deposits carefully saved for souvenirs or whatnot. Anyways — you will be experiencing A LOT, and driving even more. So make sure that you have a way to chill and relax, dwelling in the middle of nowhere. I’m sure that herbal tea works as good as vodka. Adhering to the traditional touristic routine, we chose The Golden Circle as a starting point for our trip. A lot of travel sites and guides suggest spending 2-3 days doing all the activities. However, I must admit that one day is perfectly fine to cover the major points of interest. Our itinerary would work for you if you’re fine driving long hours and 10 mins stop at a gas station to grab a hot dog sounds like acceptable lunch. In other words, it’s really about seeing and experience on your own to the extent where excitement overshadows minor inconveniences and difficulties of being on a road. We started with Þingvellir (Thingvellir) National Park and headed straight to our first waterfall — Öxarárfoss. Little did we know that it would be one of thousands of waterfalls on our way and by the end of day 10 we would get lazy to stop by the hundredth waterfall to take photos. However, Waterfall Name, serves a great starting point for improving your Waterfallology skills (I did my research on the science that studies waterfalls but couldn't find anything, unfortunately). The Almannagjá is the place where tectonic plates collide - European and North American. Also, it used to be place where first Icelandic parliament resided. The next stop on our list was Laugarvatnshellir, an alienated house built in a rock. The sense of alienation and lonesomeness has a completely different meaning in Iceland. I think that I would prefer to live by myself in Iceland. It’s only you and the overwhelming nature around you what matters in moments like this. If I lived in Iceland, I would live close to a volcano. I’d wake every morning and roll up curtains (or maybe I wouldn’t have curtains at all). I’d check how my volcano was doing and how he felt. On the very days, when my volcano was anxious or sad, I’d hike up to his core and throw pebbles in his wide open mouth. And on happy days, I’d leave him alone to enjoy solitude. Bruarfoss was the second waterfall on our list (we stopped counting after that, to be frank). I wouldn’t say that it is easily accessible, only because you have to drive through private lands and, I’m afraid, it’s just a matter of time when local residents would say that enough is enough and close the access to the waterfall. Bruarfoss is really impressive. And you are getting impressed more with every step you make wandering through the mud, orienting towards the roar of water. On seeing waterfall for the first time, it mesmerizes you with how blue its waters are and how fast they run. It was the first time for me when I saw that kind of water and that kind of blue in nature. And it was an absolutely amazing experience. Right after coming back to the road we noticed beautiful Icelandic horses and couldn’t resist to stop by and get acquainted with them. You will see a lot of horses in Iceland. Just make sure you are polite and friendly — and you will become the besties. Geysir was the next stop on our list. The mighty one, which gave its name to all the other geysers. Geysirs sleeps mostly. However, it’s younger sibling Strokkur is the one to entertain the public with its frequent eruption. To get a nice shot you have to get into the chain of thousand tourists and get your cameras ready. It is pretty hard to predict the next eruption (every 6 to 10 mins), so make sure that you maintain focus on the burning waters. And we are getting closer to the end of day one. Gullfoss, or The Golden Foss, is one of the most popular waterfalls in Iceland and must-see stop on your Golden Circle tour. It is unlikely that the waterfall would leave anyone emotionless. It impresses with its powers and you begin to understand how powerless a human is comparing to the forces of the Mother Nature. It roars, it rushes down the waters and your thoughts. All you are left to do is to stay speechless on the edge of the water, observing the beauty and absorbing this wild energy through every breathe you make. Hint: if you are on a budget and do not feel like paying for restrooms, there's a free restroom inside the cafeteria. Finally, to call it a day, we stopped at Kerið, a crater that was formed after the volcano eruption many-many-many years ago. We found a lot of blueberries around and that's pretty much it what I can say about it. I would rate it as 'nice-to-see' but 'ok-to-skip' if you are running out of time. We stayed at Airbnb that night. And by Airbnb I mean an Icelandic farm in the middle of nowhere. Unfortunately, there were no Icelanders there. Regardless of the night having already covered the island of ice and fire and we were really craving to have this wild experience of Icelandic geothermal waters. It has been decided that no matter what we should come back to the car and drive to Seljavallalaug Sundlaug. Yes, we decided to go and see the pool, which was not even correctly marked on Google Maps, in the middle of the night. After some doubts, we have finally decided that this is the parking and began our 15 minutes long hike in complete darkness, interrupted by the flashlights from our mobile phones. When we finally got there, it was very nice and rewarding experience. However, I feel that doing the same but in the daylight would be a much better idea. Meet the hot dog – your best friend and favorite food for the days to come. Sold by everyone and everywhere, this cheap food will keep you energized and happy for hours. Eat Local, Play Local. We woke at 8 am and kicked off the second day of our epic journey. Driving on the unpaved road through the golden fields, we were looking at the stormy clouds and tiny raindrops crashing onto the windshield. It was really great experience with multiple rainbows appearing through this infinite plain, decorated with hills and mountains in the distance. Gluggafoss is a small waterfall. Keep in mind that you will see many many waterfalls ahead. But any of those waterfalls would be without crowds! Take this chance and take as many photos as possible, chase some sheep, and just get amazed by the landscape. The next waterfall for the day, Seljalandsfoss, is a much more different experience. Because you may not only admire it from the distance but actually walk behind it. Get ready to get wet! And have a lot of fun at the same time. After stepping behind its waters you immediately start to imagine yourself in Icelandic saga chasing some elves in the caves! Next, proceed to Skógafoss, another cult waterfall in Iceland, which you probably saw in couple movies. On your way to the next attraction, do not forget to stop near Eyjafjallajökull center and learn how this angry volcano completely interrupted flights in Europe and North America. BTW, I bet that you, — as we did and many many other tourists, — would be trying to learn how to pronounce the name of the volcano. This fun and cultural game can keep you entertained for long hours! Trust us! We were done with waterfalls for the day (not really) and drove to the first glacier on our list — Sólheimajökull. The House of the sun (which is the name of the glacier) lies in-between green hills. It is dirty and covered with a thin layer of ash from 2010's eruption from Eyjafjallajökul. It doesn't spoil its beauty though. You still can see how this million-years-old ice is moving and breathing, crying and dripping. And at the same time, its blue color looks even more vivid under the dust cover. We didn't hike the glaciar (well, because we didn't have time) but it was still very special feeling to be standing next to it and be touching its cold core. Close to the glacier lies another popular attraction — black sand beach Solheimasandur, which is also a home to a wrecked plane. Before, you could simply drive to the plane. But with the increase in tourists visiting the country, the officials had to allocate a territory for parking and fenced the entrance to the beach. In other words — getting to the plane means 20 mins hike through the smoothest road you could have ever imagined. The scenery doesn't change at all, while you walk. And it feels that mountains behind you stand still and you do not move at all. This is a perfect time to play some games or disconnect and observe the void. The plane itself is nice to explore but kind of crowded. It still makes it a must-see attraction. This is not the only wrecked plane in Iceland but probably the most scenic one! Close to the town of Vik, you will find Dyrhólaey — an arch with a hole and lighthouse. It lies relatively high, so get ready to enjoy the views of the contingent black sand and sea swallowing the shore. It was very cold and raining all the time, so we didn't spend much time there. But I feel that we should have. Reynisfjara is another highly recommended black sand beach. Your sight would be immediately drawn to the spike-like type of the stone walls surrounding it. We heard from someone that those structures are actually trolls who got exposed to the sun and turned into stone. Also, pay attention to the puffins! They are cute and playful. Ok, and now I just got tired of writing. So here are the photos of Fjaðrárgljúfur for you. It is an amazing valley, maybe a canyon, which provides access to great heights and views. Opal is Iceland's favorite drink. And the cheapest one. When you hit it for the first time, you immediately regret it – the overwhelming taste of licorice and something unknown kills you in one shot. However, by day 3 of your trip (when you run out of alcohol), Opal becomes your faithful companion. The first stop for a day was Svartifoss. It is an amazing waterfall flowing through the basalt rocks with a great contrast against the sky. You can imagine that you are inside of a fantasy world and there's a hidden treasure lying in its basin. Jökulsárlón, or the sandbox for photographers as a lot of people named it, is another see-before-you-die attraction in Iceland. It is an iceberg lagoon where you can experience the breath and movement of Vatnajökull glacier. There's no real silence hear – cracking of ice and its drifting into the ocean provides the great soundtrack, which makes your heart beat faster. On a sad note, it also feels like a graveyard - the pieces of glacier got tired after the million years and decided to travel the world. You can hear them saying "Goodbye, Vatnajökull. We will be missing you." And now it is time for a long-long drive to the north of the island. You will be passing the change of landscape, moss fields, fog and rain, dramatic change in scenery, and every moment within the next 3-4 hours would be bringing a lot of pleasure to your esthetic education. On approaching Hveri, you start playing a new game — who farted. The game is pretty excited until you reach the geothermal wasteland. This will be the very moment when you will start dreaming about bandana to cover your nose. And this is exactly how you imagine Mars to be — stinky but beautiful, mind-blowing but suffocating. Make sure to take your time and walk around exploring the natural phenomena around you. 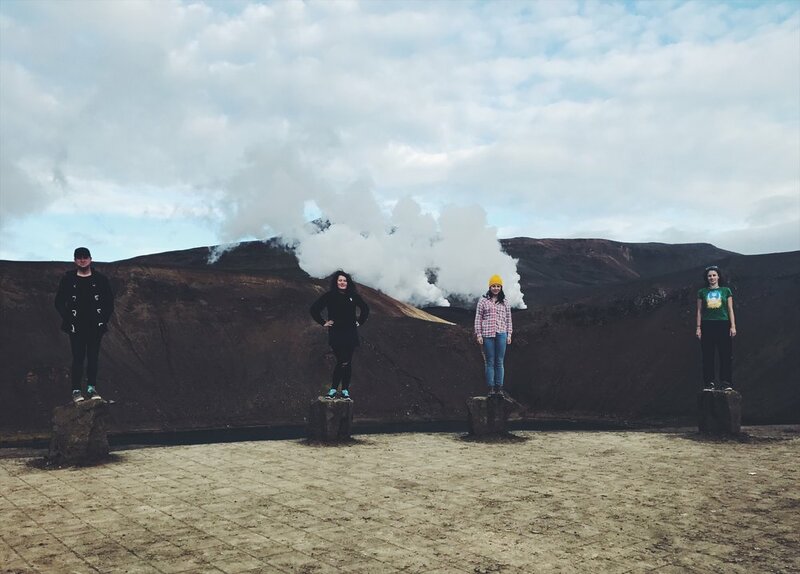 Very close to the wasteland, you will find Krafla — this an amazing crater lake, geothermal plant, and a lot of smoke. It still smells pretty bad. But the experience that you get there through observing the magic of our planet seizes the perception of negative senses immediately. Another place where we were recommended to go was Grjótagjá — a volcanic cave and lake. But to be frank with you, I feel like it can be easily skipped. It is interesting to see but I wouldn't say it is a must see place. At the other hand, Goðafoss, or the Waterfall of Gods, is just amazing. This is one of the most beautiful waterfalls we saw in Iceland. You have an opportunity to see the waterfall from many angels and many sides, which makes it even more interesting. It is also very scenic and Prometheus was shot here too. Fermented Shark of Hákarl is considered to be disgusting and a lot of people say it smells bad. That was also the opinion of my travel buddies. As for myself, I enjoyed it and it tasted alright. However, I could not persuade myself that it was good enough to eat it all. We spent a night in Akureyri before starting a new day on our journey. To be frank with you, I wish we spent more time there. The mountain around the town looks magical and the city itself turned out to be nothing but charming. On leaving out hostel, we re-affirmed our intentions for the day – we were going West. The first stop for the day was Hraunfossar – the waterfall with interesting formation story. It wasn’t supposed to be there. However, the mighty volcano what-was-its-name decided to wake up from its centuries-long sleep and spilled lava all over the land. Being captured inland, it couldn’t reach the ocean to give Iceland more territory, and when the temperature began to chill down, the streams from the nearby glaciers decided to take everything in their hands and formed a waterfall, as a logical continuation of multiple creeks and cascades. The region is populated with legend and myths. And most of them were about elves – the invisible folk highly respected by Icelanders. At some point in our journey, we decided that all the sheep that we saw were elves instead. Because they were everywhere and most of the time they seem to be invisible against the road. The next stop was a lava cave Surtshellir, located in the same lava field. Unfortunately, we didn’t make it. Because it was hella expensive. And because we had to wait couple hours to get signed up for the next group. Luckily, we discovered another free cave with a free access (make sure to assess the risk before entering). Keep in mind that in order to get there, you would need a 4x4 car due to very harsh and bumpy road flooded with many streams. Welcome to the Highlands, in other words. The cave was cool but iPhone camera sucked in the dark-to-light setting. Thus, no photos for you, folks. And some elves below. We were going deeper and deeper into Western Iceland and finally the weather began to worsen. It was raining cats and dogs when we approached Snæfellsnes peninsula. Google deceitfully split us into two campuses – while some resources were saying that it is the highest point of Iceland, the others were arguing with this statement. Arnarstapi became the first stop for us on the peninsula. This picturesque cliff used to be a part of a crater and as most parts of Iceland, it was formed by volcanic activities. The basalt spikes were eroded by the sea through the centuries, bringing even more mystery into this amazing harbor. Fun fact that we googled through our short hike in Arnarstapi – the territory around has never been used by the farmer because elves live there. And nobody wants to deal with elves. Skarðsvík is a small golden sand beach next to Arnastrapi. It is considered to be beautiful and stuff but for us, spoiled Californians, it wasn’t anything special. So I would say that it is ok to skip (or maybe you should go and try it yourself and there would be something that you would discover and keep close to your heart for days to come). Rye Bread Ice Cream is a thing that you can try in Iceland only. Found in several places in Reykjavik, it gives you a great taste and nice sweetness to the end of your journey. The trip around Iceland would have been incomplete without deep diving into the history of the county as well as a quick peek into the way Icelanders used to live many years ago, right after they migrated from the big land. We set our course to Eiriksstadir, or the Viking lounge, as a stop before entering wild and unknown West Fjords. There is an entrance fee. However (I am not sure how) we didn’t know about it. A seasoned Viking let us take couple photos with him and even gave us 10 mins to see what was inside the cabin. This free sight left us without an excursion, so we do encourage you to pay if you want to listen to the Viking stories and Scandinavian sagas. Having left the Eirikstaddir, we found the nearest gas station to have a full tank and put all the gas stations on Google Maps. It is very very important to make sure that you have enough gas on your road around West Fjords – in most parts there would be no coverage and, a nice bonus, people. So if you get into trouble there would be no one to help you. Elves will come and eat you or you will get abducted by some gang of trolls. The gateway to Westfjords looks amazing. You immediately know that you entered the region. After driving for some time and stopping by every pullout with views, we got to the first attraction on our itinerary – Gardar BA 54, a ship abandoned in the middle of nowhere. The officials do not encourage you to enter the ship, however, there’s plenty of ways to make your way up (roll d20 for acrobatics check). I, personally, found this place the favorite among all Westfjorden. It was amazing and magical and I just wanted to stay there forever. After the ship, we dispatched to the Raudisandur, the golden sand beach. On arrival, the first thing that you would notice - is a sign that reads ‘Do not poop here’ and a black church. We took the photos of a church and began the search of the beach. Disclaimer - we didn’t find it. Haha. It was a nice hike in the grass but when we made it to the sandy part it was already high tide and we didn’t feel like walking another mile through the wet sand. There are many tourist attractions in the fjords, however, the true magic is not into seeing them and taking breathtaking pictures, as with mainland Iceland, but rather the experience of beauty and solitude that is preserved here. On our way to see puffins, we saw some museum with more wrecked ships and planes and decided to stop by to take photos. We didn’t go into the museum because it was already way past noon and we had yet a long distance to cover for the day. Finally, we got to Látrabjarg, the westernmost part of Europe and Iceland, which is well known by the families of puffins residing on the cliffs. You have to be very careful to explore the cliffs and if you want to see them you have to lay down on the ground and slowly crawl to the precipice. We spent around two hours hiking through the wind and rain and got cold and wet only to find puffins. And we found - none. Turned out that September is not a season and all puffins are gone. That was disappointing. We still had a lot of fun in Látrabjarg and admired the beauty of the sea. For the night we rented a small house on a farm facing the fjord. It was really cool! We were impressed by amazing views. We started to cook dinner with mashed potatoes, salad, and whale meat. Whale meat tastes like liver and everybody loved it. We also had chicken, though. Just in case. Good night, fjord. Sweet dreams. We also tried whale meat and it was delicious. We found frozen stakes Hrefnusteil in Bonus and cooked it with a salad and mashed potatoes. It tasted great and everyone really enjoyed it. Good morning, the fjord. We woke up when sheep and friendly pigeons decided to greet a new day. Breathing a clean fresh air, we packed our bags back into the car and were back on a road. The last day did not include a lot of attractions. We just wanted to finish the loop around Westfjords and chill a bit in a cabin, we rented. Sea Monster Museum was the first stop on our trip. To be frank, it is ok to skip. It was fun, however, the main purpose of that stop was to get connected to Wi-Fi, have a cup of coffee, and text the families that we were still alive and happy. It is pretty difficult to find Samuel Johnson’s Art Farm, so I suggest that you use GPS coordinates instead of looking up by the name (N65° 47' 16.680" W23° 59' 28.021"). The farm contains the work of famous Icelandic architect and artist, and I really enjoyed it. We finally got to Dynjandi waterfall and it was kinda sad. It was the last ‘official’ waterfall on our itinerary. After that, we didn’t have a particular plan. We were just driving around, listening to audio-books, and stopped by anything that was bearing interest. Like this communal house with cafe. Or this views from the road, as we were passing through the ridge. I do believe that it is the moment you live for - to admire how big nature is and how small you are in this network of cosmos. The end of the day was to spend some time in the geothermal waters. We found a ‘hidden gem’ on google and headed there, where spent an hour or so until the sunset. Fully relaxed, we got on the road to enjoy our last night on this road trip in the cabin in the middle of nowhere, enjoying the silence and listening to the songs about Eyjafjallajökull on the local radio. This was the greatest road trip ever! If you’ve been to Iceland and never attended went any public pool – you have never been to Iceland. Icelanders have this special and crazy obsession with geothermal waters (both wild and maintained). It is a cheap and very fun experience. Highly recommended. In the end I just want to say that there would be no trip to Iceland without Sigur Ros. Sign up with your email address to receive more travel reports. We respect your privacy. We will never share your email with anyone. Cross my heart and hope to die, put a needle in my eye. We are like you. We respect your privacy. We will never share it with anyone else. Cross my heart and hope to die.